Where do you go to unwind? A spa? A monthly massage appointment? The library? There is something that causes stress to ooze out of me when I am at GriggsDakota (or in our family, it is termed “the farm”). Yesterday was extraordinarily special and I am so renewed from the day. We had a 60th wedding anniversary to celebrate with my grandparents combined with a wide array of family time across five generations. Plus the girls made sure we squeezed soybean harvest into the day. 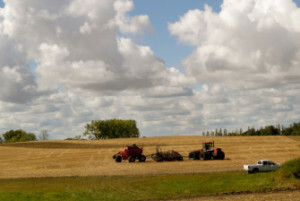 There were our two combines rolling plus neighbors were there to help out on harvesting soybeans. As I took pictures and video in the first field we were in, Jake pulled up alongside of me in the grain cart and said “Want to ride along?” Jake works on the farm for my parents and grew up nearby. His mom has been a dear friend for decades and we’ve known Jake his whole life. He was in my sister’s class growing up and through high school. As I jumped in with him I realized Jake isn’t the “boy” eight years younger than me that I always think of him as but instead he is a young dad and farmer, dumping on the go with four combines as we talked crops, harvest factors and more. Jake pointed out to me that he hasn’t seen me out the fields much this year. I gave him some excuses of “crazy chaos, career and kids” but it got me thinking. I need to be out in the fields more frequently. The migraine headache I had been fighting after a work presentation and travel of 6 flights in 32 hours to make it all work evaporated yesterday as I spent time with my farm family. I don’t need a spa to rejuvenate. I need a little soybean harvest dust. 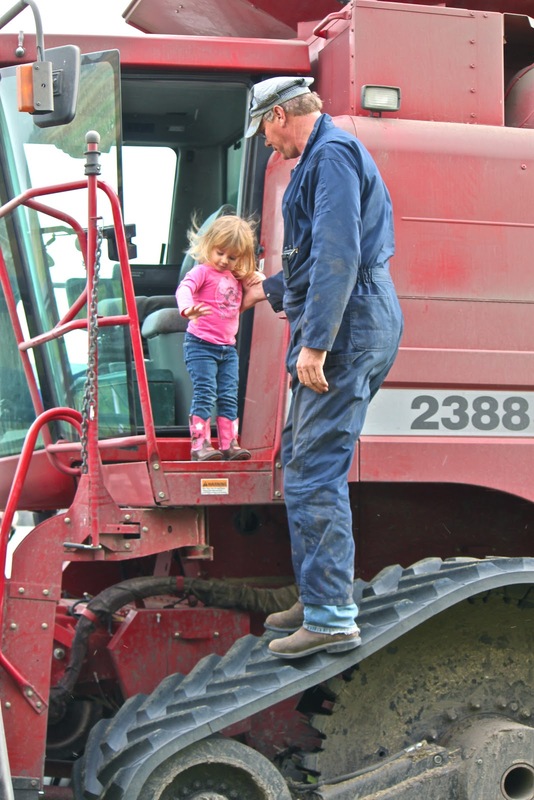 And I need to see my girls arguing over who gets to ride in the combine with my dad. It’s not rated as a top spa get away. But I will take any day in farm fields during harvest as a place that brings me renewal, energy and happiness over getting pedicures, manicures, masks and massages in a spa. Adding more depth to the day was a side of roses to my soybean dust spa day. Not just any roses but particular roses that my grandpa ordered special for my grandma on their 60th wedding anniversary which was yesterday. Last night we had a lobster feast, corn on the cob and cheesecake for a family celebration, all put on by my mom. The combines rolled in from the fields just in time to join us for a late meal filled with laughter and plenty of entertainment from two overtired farm girls. Soybean dust “spa” is my go-to destination for renewal. Do you have a location or activity you enjoy to rejuvenate and renew yourself? I agree, Katie. Going home to work can be very relaxing and refreshing. I love doing cattle work, but doing it with my Mom and Dad somehow opens a different level in my mind. It is always more fun to help someone else do their chores v. doing your own. It was really neat to have the experience of showing sheep with my family at the NE State Fair. Hope harvest continues to go well! Great post Katie! I think the field is a great stress relief! wow – what a fabulous day!! great memories! this is awesome! i so agree with you. i don’t like the fuss of spas and salons. give me dirt in my toes, and i’ll tend to my own hair and fingernails. Well, I do like a massage now and then (like twice a year, if I’m lucky – it’s been over a year now though), but there is something soothing about getting work done around the place. Wow! I was just asking the NDV crowd the same question in the Mom2Mom section. A soybean spa sounds pretty darn good! Sounds like a wonderful day! I love getting to see all the big farm equipment. Being outdoors is energizing, whether its in a park, a city street, or a field. And I do like the spa. Just booked a series of massages to get me through the next few stressful months of transition. It’s a luxury, but I figure it will be worth it. Hi, found my way here from my friend Andrea at Rural Revival. I’m now following and looking forward to reading back through your blog. I love this! The land and the farm really are rejuvenating. My pasture is my go-to place! This made me all warm and fuzzy inside! I completely get what you’re saying. When the city life gets me down I always head to the “farm” where I know I’ll end up working but for some reason it’s better than any day in the city.